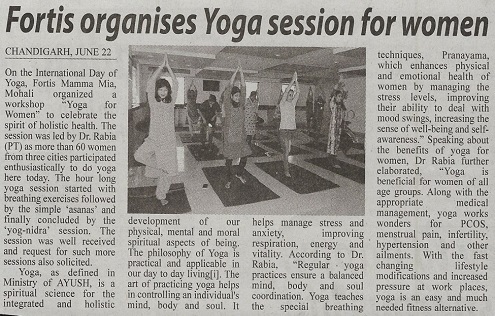 On the eve of International Day of Yoga, Fortis Mamma Mia organized a workshop on ‘Yoga for Women’ to celebrate the spirit of holistic health. The session was led by Dr. Rabia (PT). More than 60 women from three cities participated enthusiastically to do yoga here today. The hour long yoga session started with breathing exercises followed by the simple ‘asanas’ and finally concluded by the ‘yog-nidra’ session. The session was well received and request for such more sessions also solicited.